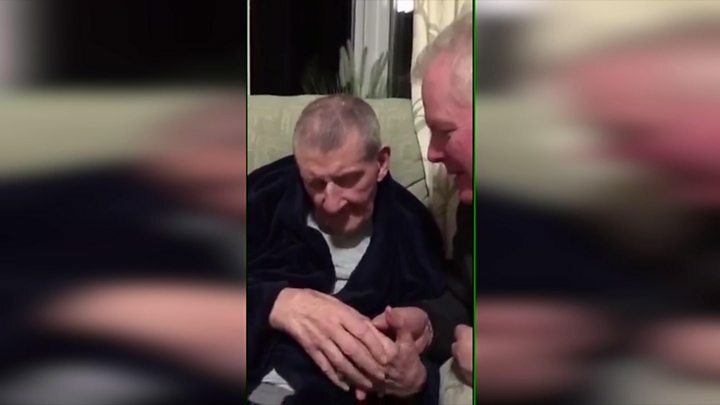 A deafblind dementia sufferer was made to sit in a chair soaked with his own urine by a care home manager, his daughter has claimed. Rhona McKinlay said 84-year-old William was left "utterly humiliated" for hours at the Latimer Grange home with a circle drawn around his chair. The ex-prison officer said she had seen inmates treated better than her father. Home owner Anthony Lampitt was contacted by the BBC, but a solicitor and PR firm responded on his behalf. A spokesman for the home said it took "all allegations very seriously" and was "confident we provide a good standard of care". Northamptonshire County Council and Northamptonshire Police are investigating. Mrs McKinlay said her father, who hailed from Glasgow, also suffered bruising, flea bites and was not fed properly by carers at the home in Burton Latimer. She recorded all her concerns in a diary, in which she wrote: "Dad saturated in urine, sitting in chair, wet to his knees and up his back. "Anthony Lampitt drew a chalk ring around my Dad and made him sit back down. He was utterly humiliated." One former care worker, who did want to be named, told the BBC it had been her job to return Mr McKinlay to the chair. A chalk circle had been drawn around the furniture to alert others it had been soiled and required cleaning, which is common practice in homes. She said: "Mr Lampitt said to put him back there 'as he is not going to urinate everywhere else'. "He wanted to keep him there. That made me feel guilty. I felt like crying." Mrs McKinlay said matters reached a head when Mr Lampitt said her father was being put on a new drug. She said she denied him permission to do so, but was shocked to find he had told carers to administer the medication anyway. The home's spokesman said it was legally required to follow the advice given by GPs and community psychiatric nurses and it had a robust medicines management policy. Mrs McKinlay said on another occasion she found a large bruise on her father's stomach, but staff could not explain how it happened. "The weight was falling off my dad. At one point he was covered in flea bites. They had to have the place fumigated," she said. "They couldn't be bothered feeding him. He couldn't see the food put in front of him and doesn't have the mental capacity to eat properly himself. The carer said if there was a shortage of meals on a specific day food "would not [be given] to residents with dementia as they would not remember". Another member of staff, who also wanted to remain anonymous, alleged residents were left for months without being bathed. "One time we took [William's] top off and he had 16 flea bites because there was a cat in the home," she said. The care home said pets were allowed on the premises to provide a "home-away-from-home care experience" but pro-active flea treatment was undertaken. They added there had been times the home had been "unable to meet" Mr McKinlay's care needs. "Our home is not equipped to support individuals suffering from advanced sight and hearing loss, as well as challenging aggressive behaviours." Mrs McKinlay said her father had been crying when she visited and had since moved to a different care home. "The guilt was killing me," she said. "Sometimes now my dad says, 'please don't make me go back to the bad place'." The council said prior to the launch of its investigation into Mrs McKinlay's concerns, it had suspended new admissions to Latimer Grange after a routine contract monitoring visit. The home said it was working with the authority on a number of actions and the "health, welfare and safety" of residents was "our primary focus." A council spokesman said it was aware of the issues raised by Mr McKinlay's family about the quality of care at the home. "We are working closely with the private care home provider and the Care Quality Commission (CQC) to investigate those concerns," they added. In light of Mrs McKinlay's concerns, the CQC inspected the care home in February but found standards were good. A CQC spokeswoman said it had shared details of the complaint with the home and the authority and all "had been subject to safeguarding alerts". She added: "We are continuing to monitor this service." Mr Lampitt previously owned two other care homes, the Da-Mar Residential Care Home in Northampton and Clifton Residential Home in Rushden. Both were wound-up due to financial problems and had been told they required improvement following inspections.